The Amazon River covers a massive part of South America and is one of the most species-rich places on earth. There are over 1500 species of fish described from the Amazon basin, with many hundreds of fish yet to be described. About 85% of the region’s fish belong to a group called the otophysans, which includes characins, catfishes and knifefishes, but there are also hundreds of cichlids and other species. There are now believed to be several Arapaima (above) found in the Amazon basin – some can reach nearly 3m/10' in length. Besides these massive bony tongues, the area is also home to two different species of arowana: the Silver arowana, Osteoglossum bicirrhosum and the less common Black arowana, O. ferreirai. The Amazon basin is rich in Characiformes (or characins) and there are hundreds of tetras from several families, including the Characidae, found here. Representatives of this group that are common in the aquaria include the Pristella tetra (above), Pristella maxillaris, the Rummynose, Hemmigramus rhodostomus and many more. The Amazon is famous for its piranhas, like the Black piranha, Serrasalmus rhombeus shown above. Many of these, such as most of the 20 plus Serrasalmus and Pygocentrus species are predominantly (but not exclusively) carnivorous. However, the Amazon is also home to many related pacus and silver dollars, which are herbivorous. The headstander characin family, Anostomidae, are common in the Amazon. The area is home to the Marbled headstander, Abramites hypselonotus, Anostomus anostomus and A. ternetzi, Laemolyta taeniata (above) and L. garmani, a Leporellus, over 13 Leporinus, two Pseudanos, two Rhytiodous and two Schizodon species. Pencilfishes are members of the characin family Lebiasinidae and are common in the shallow, backwaters and slower-flowing creeks of the Amazon and its tributaries. Many of them, such as these Rocket pencilfish, Nannostomus eques, live in very shallow water just a few inches deep. The area is home to over 30 different lebiasinid species. There are probably more catfishes in the Amazon than anywhere else on earth. They differ widely in size, from tiny suckermouths like Otocinclus (above) and parasitic candiru that feed on the blood of other fish, to very large predatory pimelodids, such as the massive shovelnosed Brachyplatystoma species, which can top six feet long. The deeper parts of the Amazon are relatively unexplored compared to the shallows, and scientists are discovering new knifefishes regularly. Knifefishes, such as the Black ghost (above) are weakly electric and produce little pulses of electricity to help navigate, communicate and tell species apart. Over a hundred species are known from here. 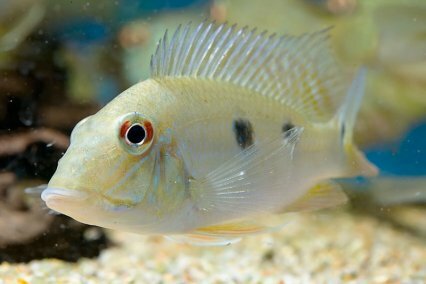 There are quite literally hundreds of cichlid species found in the Amazon and they’re abundant everywhere. They range in size from the tiniest Apistogramma species to middle-sized eartheaters, such as the Satanoperca above, up to the massive peacock bass of the Cichla genus. Virtually all of them are popular and sought by fishkeepers. Toadfishes are members of the order Batrachoidiformes, which are predominantly marine. However, two species are known from the Amazon and are found in freshwater hundreds of miles from the sea. One of them, the Prehistoric monster fish, Thalassophryne amazonica, is a popular aquarium oddball and sometimes spawns in captivity. The popular Motoro stingray, Potamotrygon motoro, is found in the Amazon, along with five described and many undescribed species. Scientists have also described the stingrays Plesiotrygon iwamae and Paratrygon aiereba from the Amazon. These fish live in sandy areas and are much feared by locals due to their potentially deadly stings. Although most of the fresh and brackish water puffers you see in the trade are from Africa and Asia, South America is home to a couple of species and they’re both found in the Amazon. The peaceful freshwater Amazon puffer, Colomesus asellus, and the somewhat more feisty brackish Banded puffer, C. psittacus are both sometimes seen for sale. The swamp eels aren’t really true eels like the ones we see in UK waters, they’re members of a group called the Synbranchiformes. The Amazon has at least two described species, the Marbled swamp eel, Synbranchus marmoratus, and the Madeira swamp eel, S. madeirai. They can reach 1m/39” long and sometimes turn up in the shops. This item first appeared in the October 2009 issue of Practical Fishkeeping magazine. It may not be reproduced without written permission.